A monthly ‘One Stop’ drop-in for young families launches in Shurdington in March 2006. 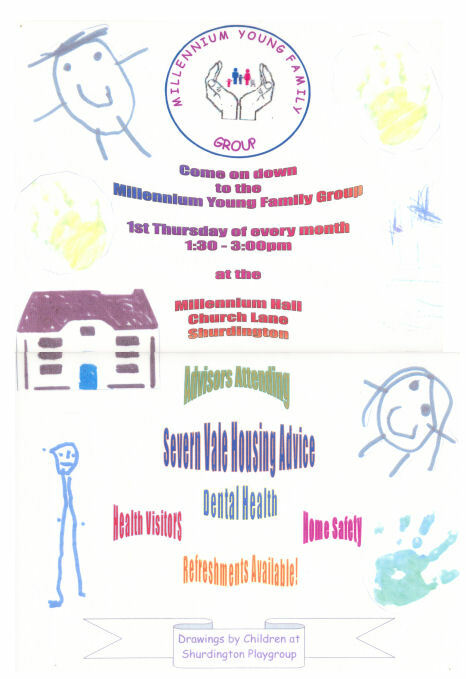 The group will be launched at the Millennium Hall, Shurdington on Thursday 2nd March 2006 between 1.30pm and 3.00pm. It will then be held on the first Thursday of each month between 1.30 and 3pm. All families with pre school children in Shurdington will be receiving an invitation very soon. Health Visitors, Severn Vale Housing, Home safety & Dental care. The child clinic is available from 1.30pm to 3pm on the first Thursday every month.